Sketchbooks, stencilled with the TangentProjects ART symbol had a little piece of art randomly placed within their pages and were sold at the fair. A collaborative project curated by Liz Sheridan, IAS invited artists to respond to the theme of 'Invasive Alien Species'. The resulting exhibition was held in a pop up space on the Via Garibaldi during the 2011 Venice Biennale. TangentProjects guest tutored on the 'Caravanseri: Stepney City Farm Centre' project for David Haney's foundation students at Kent School of Architecture in January. The project involved both a site visit to the farm and a concept model workshop at the School of Architecture in Canterbury. As a comment on the Age of Austerity we ran a TangentProjects ART Pound Shop. Everything we made, from brownies to notebooks, flags to matchboxes, was flogged for a pound. TangentProjects took part in the Critical Practice event, Parade: Public Modes of Assembly and Forms of Address as part of their Market of Ideas segment, using our work on Liminopia as the trajectory to host a series of informal discussions with invited guests from the art, design and architecture industries, as well as the Market of Ideas audience. TangentProjects collaborated with the Travellers Box, a project originated through Danish artist Lars Vilhelmsen. Our piece, Liminopia, was a fantasy urban environment constructed from in our studio from found objects and was 6 months in the making. Inspired by the Trash Vortex, a huge mass of plastic and debris floating around the Pacific Ocean, artists created site-responsive works which were dotted around the Festival site. 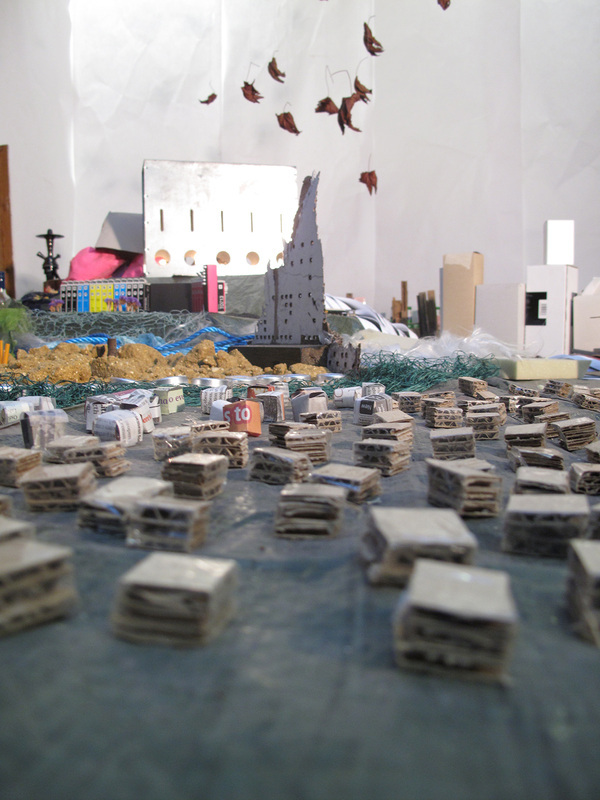 The resulting work included interventions, performance and responses to the environment. A collaboration between Liz Sheridan and Cedric Christie, with the support of Valley Kayaks, a customised sea kayak is being used as a vehicle for exploring the overlooked margins of the European continent. The inaugural exhibition for TangentProjects featured Steve Smith, Helene Kazan, Simon Fraser, Cedric Christie, Emily Candela and Karen Ay. Inspired by Eyal Weizman's book, Hollow Land, artists were asked to occupy their own territory in the gallery space. The resulting work came from lengthy negotiations between the artists in order to formulate how their work integrated, as well as how they mark their own and each others' territorial space within the gallery. These conversations became part of a process that engendered and became a part of the work itself.